When we are creating a product our goal is to improve our customers daily lives by helping them with their tasks, it doesn’t matter the type of work they do or their area of expertise. When you work in a field that is closely related to customers, like in my case as an UX designer, part of your work is to understand the customers, be in their shoes and be able to understand what do they need, so we achieve something good enough to simplify their lives. However, most of the time a designer decision is surrounded by a lot of uncertainty because we start based only on an idea. In order to succeed we must learn how to solve our customers problems, at the beginning we can do a lot of assumptions and also establish some hypothesis about what we think could be a good solution, but lucky for us we don’t have to do it alone. There’s a methodology that can guide us through the process, Lean Startup. While I was getting to know the Lean Startup method of Eric Ries, his objective was pretty clear to me. The goal of his method is to put you and your team in the right path to create the most accurate product for your idea. Everyone who’s ever taken a shower has an idea. It’s the person who gets out of the shower, dries off, and does something about it who makes the difference. We have to do a lot of thinking around our initial idea. The probability of failure for a new product is pretty high, that’s why we need to decide the appropriate way to generate it and launch it. Lean Startup allows us to do it with a profitable and scalable business model, increasing our probabilities of success. The way it does it is by using the basics of a scientific approach, so we validate every assumption using the help of our future customers, getting to know them in a more direct way. Should this product be built? How important is the problem for my customer? This is our first analysis about the idea, so our answers would probably be based on hypothesis. Using our findings we can decide if our product allows us to build a sustainable business around it. Every idea needs a north to know where we’re headed. This north can be defined as our vision and to achieve that vision we can establish a business model using the Lean Canvas. 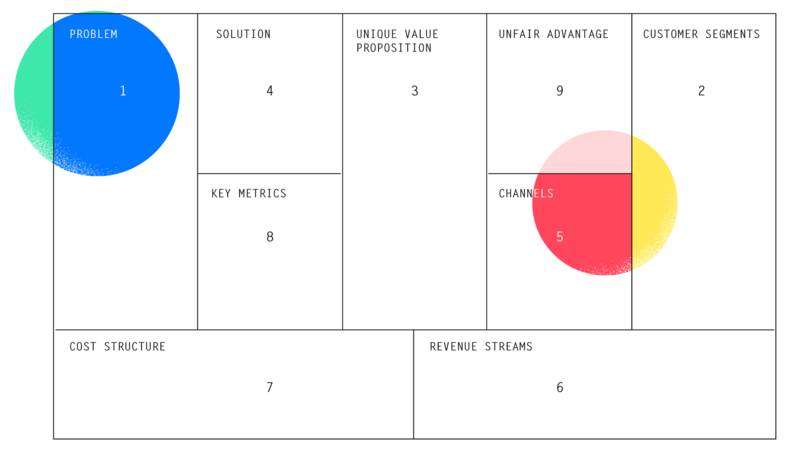 This canvas, which is a template used to describe the essential aspects of your startup, is divided in to nine sections, each one is important to fully understand our business. All the nine sections are related with each other, so we write the problem that we want to solve, the possible solutions that we proposed for it, our unique value proposition and the pathways that we are going to use to reach our customers. Also it’s important to define the customer segments and the key metrics that we’ll use to measure our success. Problem: List the 3 most important problems that need to be solve. In this part you can also mention the existing alternatives, explaining how this problems are being solve today. Customer segments: Once we find which are the problems, we can focus on who is having them. We need to identify who are our potential customers. Unique value proposition: Which pain are you healing for the customer? What makes it different from the competition? You need to have a unique way to provide the solution to the customer. Solution: Write all the thoughts you and your team have about the easiest way to start solving the problem. Channels: Paths to reach your customers. Which channels can we use to have a sufficient quantity of clients?. Revenue streams: We evaluate the profitability of our idea. How are we going to charge our customers? Cost structure: List the operative costs of making your product, this would be just an approach because the costs can increase or decrease during the process. Key metrics: Choose the metrics that you’ll use to measure your business performance and success. Unfair advantage: Define what have your product that can’t be easily copied. What makes your product different from the others in the market? Once we completed this canvas we can have a bigger picture of our business, and we will know what we need to go through the method. One of the most relevant things about Lean Startup, is that the method is based on a Loop of iteration and feedback. This Loop leads us to define our first approach to reach the product that will solve the problem. This step of the loop takes us to the concept of MVP (Minimum Viable Product) which is a version of the product that let us get validated knowledge with the minimum amount of effort. We need to create a product based on the hypothesis that we define in the canvas, this one will help us start testing our assumptions. As humans we all relate the concept of quality with the opinions of others, but when we are starting a project we aren’t a 100% sure of who our customers are and what are their preferences. Empathy: In this stage you must connect with your customers and get feedback by making interviews. The objective is to understand which problem has to be solved. Stickiness: Once you define how the problem will be solve you have to proof that your customers are engaged and willing to pay for it. Virality: You need to define what will keep customers referring the product to others. What makes your customer share your product ? Revenue: In this stage your company starts growing and you have to define how to monetize in order to keep a profitable business. Scale: Knowing that you have a great product on the market, you try to get into new ones and increase your staff. MVP: Once that we have our Minimum Viable Product we can gather real data and establish a baseline about what customers want and what we need to achieve in order to satisfied them. Tuning the engine: By getting feedback we can improve our product continuously till we reach our ideal product. Pivot or persevere: After we improve our product according with our customers needs we reach a point of decision. In this point we decide between to pivot, which means to make some kind of change, or persevere in which case we keep our current course. We are going to see more about this in the learning stage. During these three steps we need to choose wisely what are the metrics that we are going to use, because we don’t want to track data that is meaningless for our approach. We can easily identify two types of metrics: Vanity and actionable metrics. Vanity metrics most of the time look good but doesn’t mean anything for our product progress. This metrics always show exciting numbers, but the main characteristic is that this metrics aren’t related to anything that you can control. So… be careful, the vanity metrics can mislead you. In the other hand actionable metrics are tie to tasks that we can control and improve to reach the goals that we define. This kind of metrics allows us to clear up what to do next. Measure the metrics that matters. The point of decision that we reach with the innovation accounting lead us to the third step of the lean loop: Learning. The final objective of the loop is to allow us to learn as much as we can about our customers, so we can improve our product features to fit in the customer needs. ¿Are we making progress with our initial hypothesis, or we need to make a change? Zoom-in Pivot : What was considered a feature of the product, becomes the whole product. Zoom-out Pivot: A whole product becomes a single feature of a larger product. Customer Segment Pivot: Our product solves a real problem for some customers that aren’t the customer we originally planed. Customer Need Pivot : Our customers had a real problem but is not the same as we thought. Knowing this, we can decide the type of change that our product needs to help us create a sustainable business. So, as a summarize of the entire loop: First we have to choose a KPI (Key Performance Indicator) based on the test done with the MVP, then we draw a base line for that indicator and find the possible ways to improve our product. After that we create a hypothesis and test it, measuring the results to verify that we move the needle in the right direction and reach a decision point. As much as we iterate over the loop, we’ll learn more about our customers and understand their needs as well. Also, we’ll be able to launch to the market something that will make a difference and ease their lives. In other words, we can be able to do positive impact and create accurate solutions depending on how we manage our creating process. Somos un estudio creativo de innovación y desarrollo. Creemos en el valor de las personas, en la creatividad y tecnología, como medios para crear soluciones.